LAS VEGAS, Feb. 3, 2011 – 2009 World team member Jake Dalton of Reno, Nev., leads the all-around after the preliminary competition at the 2011 Winter Cup Challenge at the Las Vegas (Nev.) Sports Center. The competition concludes with finals on Saturday, Feb. 5, at 7:15 p.m. PT. Dalton, who competes for the University of Oklahoma, posted an 88.100 in the first day of all-around competition, recording the top score on floor exercise (15.900). 2010 World horizontal bar finalist Danell Leyva of Miami/Team Hilton HHonors, finished in second (87.450) and posted the highest score on high bar (16.000). Glen Ishino of Santa Ana, Calif./University of California, Berkeley, finished in third (86.900). Andrew Elkind of Cherry Hill, N.J./Team Hilton HHonors, finished fourth with a 86.000 and earned the top parallel bars score (15.500). CJ Maestas of Corrales, N.M./U.S. Olympic Training Center, rounded out the top five at 85.700, along with the high score on still rings (15.450). The rest of the top 10 includes: Alex Naddour of Gilbert, Ariz./University of Oklahoma (84.900); Jesse Silverstein of Suffern, N.Y./U.S. Gymnastics Develop Center II (84.100);Steven Legendre of Flower Mound, Texas/University of Oklahoma (84.000); Joshua Dixon of San Jose, Calif./Stanford University (83.650); Paul Ruggeri of Manlius, N.Y./University of Illinois (83.350); and Sho Nakamori of Albany, Calif./Champions Academy (83.350). 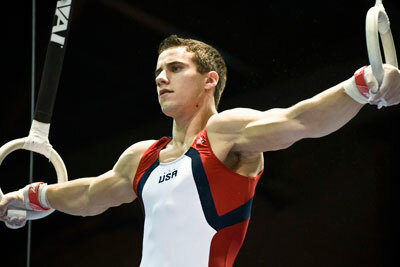 Sam Mikulak of Corona Del Mar, Calif./University of Michigan, posted the top score on vault (16.050). Jonathan Horton of Houston/Team Hilton HHonors, who only competed on one event due to a broken thumb, posted a 14.200 on still rings. The top 42 gymnasts using the Men's Program Committee's points ranking system advanced to the final session, along with the top three gymnasts on each apparatus. The all-around and individual event champions are determined by a combined two-day score. Performances at the 2011 Winter Cup Challenge will help determine the 15 men who will comprise the U.S. Men's Senior National Team through the 2011 Visa Championships in St. Paul, Minn., Aug. 17-20. The seven members of the 2010 World Championships Team retain their spots on the national team. After the conclusion of the Winter Cup, the remaining eight spots will be determined based on the following criteria: the highest-ranked all-around athlete who is not a member of the 2010 World Championships Team; the top four gymnasts based on the National Team Point Program; two athletes selected by the Men's Program Committee; and one athlete selected by the national team coordinator.